Stuck in a rut. The Venue 11 Pro was conceived as a tablet for use in the business environment. 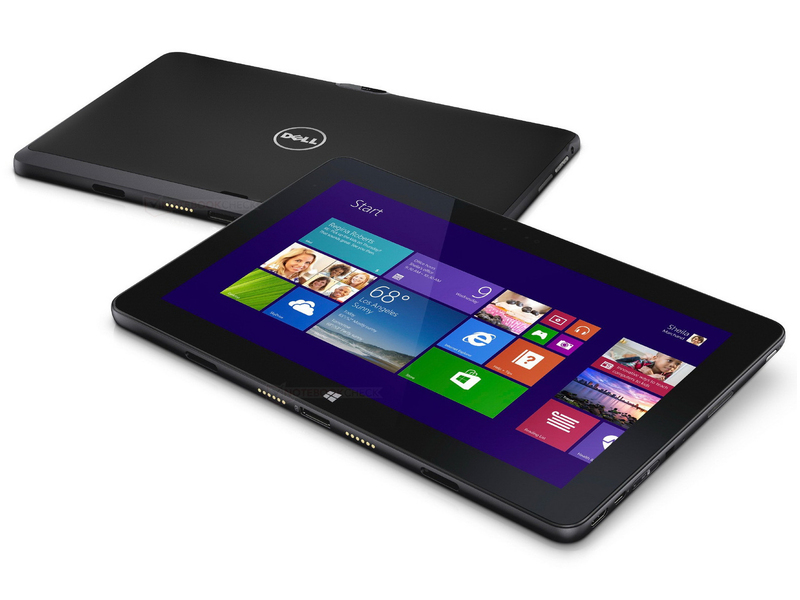 Dell outfitted the device with a Full HD IPS display and made it easy to access the tablet's inner workings. A quick SSD and a Core i5 processor do the device credit on paper too. But all told, can the tablet win us over? We're already familiar with the Dell Venue 11 Pro: In January 2014, we reviewed a model from this line. That version ran on a Core i3 processor; our current test device boasts of a Core i5. The new processor looks better on paper, but does the tablet really gain anything? Is it worth it to pay the higher price compared to the Core i3 model? Our review reveals the answers. The Venue 11 Pro's competition consists of business tablets manufactured by other companies, for instance the Lenovo ThinkPad 10 and the Microsoft Surface Pro 3. Since the two Venue 11 Pro models are structurally identical, we won't cover the case, connectivity, display or speakers in detail. 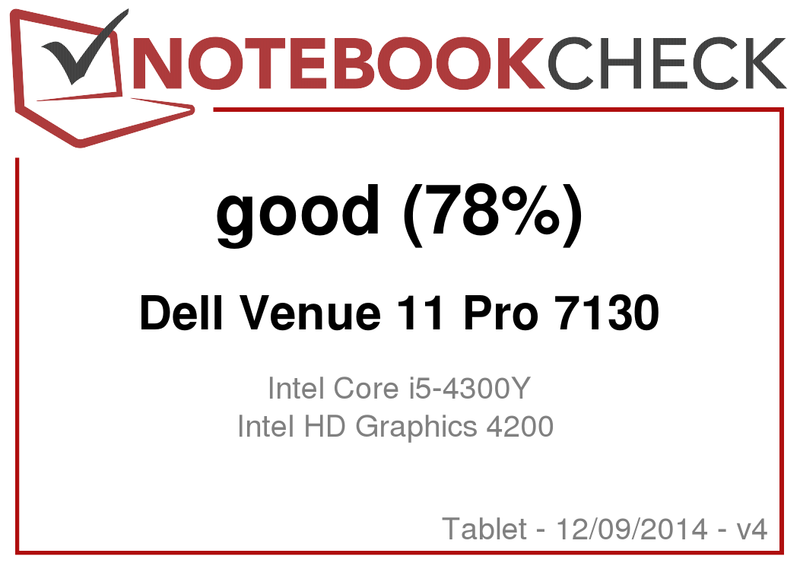 See our review of the Core i3 version of the Venue 11 Pro for more information on these subjects. The Venue 11 Pro is equipped with the same display as its sister model. This is a bright, high-contrast IPS display with stable viewing angles. The measurements we recorded were a little different for the two panels, but this is normal. Two structurally identical displays never register 100% identical results. The Dell Venue 11 Pro is primarily designed for business people. The processor's performance is more than sufficient for everyday office tasks. Dell offers this tablet in a variety of configurations, including versions with 3G modems. Our test device costs around 1,000 Euros (~$1222). Dell is also producing less expensive models with Atom processors, starting at around 380 Euros (~$464). The tablet runs on a Core i5-4300Y dual-core processor (Haswell). The “Y” at the end indicates that this is a very energy-efficient CPU. At 11.5 Watts, the TDP is even lower than that of a “normal” ULV processor (15 Watts). The CPU's base clock rate is 1.6 GHz; using turbo, the speed can be increased to up to 2.3 GHz. However, the processor almost never utilizes its full performance capacity. The CPU completed the Cinebench benchmark's single-thread tests at 1.4 to 2.3 GHz, while the speed generally hovered around 2 GHz. 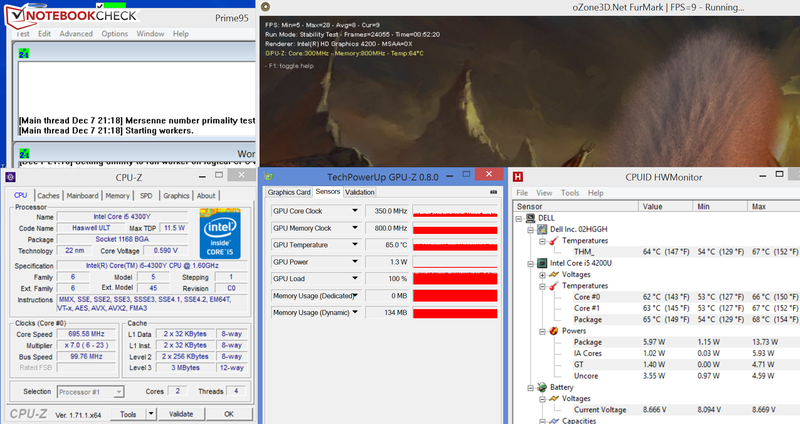 The processor performed the multi-thread tests at 1.3 to 1.4 GHz. The CPU's behavior was identical in both AC power mode and battery mode. The processor's results in our various benchmarks were disappointing. Because the Core i5 didn't use its turbo in the multi-thread tests and even ran below its base clock speed, the processor's results are lower than those of its sister model's (outfitted with a Core i3-4020Y). Our test device's single-thread performance, however, proved to be superior to that of the Core i3-4020Y Venue. The processor can use its turbo for single-thread applications. Together, the Core i5 processor and speedy solid state drive make for a fast and stable system. Windows starts up quickly. The tablet's PCMark 7 score is very good, thanks to the fast SSD. But the PCMark 8 results are disappointing -- even with a weaker processor, the sister model obtained a higher score. One look at the CPU and GPU speeds reveals the heart of the matter: As soon as the CPU and GPU are simultaneously under load, their speeds drop significantly. In the gaming portion of the PCMark 8 Home benchmark, the CPU ran at 600 MHz and the graphics core at just 400 MHz. A solid state drive from Lite On serves as the tablet's mass storage medium. This is an M.2 format model and offers a capacity of 256 GB. The drive's transfer rates are good, though it can't keep up with top SSD models like the Samsung 840 Evo. The HD Graphics 4200 graphics core takes care of graphics tasks. It supports DirectX 11 and runs at speeds of between 200 and 850 MHz. The Venue 11 Pro's sister model is equipped with the same GPU. The two tablets' results in the 3DMark benchmark are on par with each other. Both obtained normal results for devices outfitted with this graphics core. In terms of performance, the HD Graphics 4200 core falls towards the lower end of our table (see below). AMD offers stronger GPUs in this segment of the market, for instance the Radeon R4 (Beema) core. The Venue 11 Pro fluidly renders games that don't demand too much of the hardware. The games available in the Windows Store shouldn't be any problem for the device. Just like in the PCMark benchmarks, the Venue's sister model achieved better results in our gaming benchmarks -- in the form of higher frame rates. Here again we see the outworkings of the fact that the processor and graphics core both slow down substantially when the two are under load simultaneously. The Venue 11 Pro is equipped with a fan. In idle mode, the fan generally stands still, which means the whole device runs silently -- as is true of the Venue's sister model as well. Of course, under load the fan gets going, but the sound pressure level is relatively low. The Venue 11 Pro completed our stress test (Prime95 and Furmark running simultaneously for at least an hour) in the same way in both AC power mode and battery mode: While the processor ran at about 600 to 800 MHz, the graphics core went about its task at 300 to 400 MHz. The tablet didn't heat up excessively. We measured temperatures of over 40 °C (104 °F) in four spots during the stress test. The Venue's sister model remained somewhat cooler. (±) The average temperature for the upper side under maximal load is 36.4 °C / 98 F, compared to the average of 30.7 °C / 87 F for the devices in the class Tablet. The Venue 11 Pro's energy consumption rates explain its poor performance in our benchmarks compared to its competitors: Under medium (3DMark06 running) and full load (stress test: Prime95 and Furmark running simultaneously), the tablet's power usage lay at 16.6 Watts and 15.11 Watts, respectively. These numbers are considerably lower than the 21.1 and 22.1 Watts we recorded for its sister model. Remember, the latter is outfitted with a weaker processor. Our test model's CPU and GPU don't run at anywhere near their full speed, and especially not at the same time. At lower speeds, the cores require less energy. In our WLAN test, which is designed to simulate practical, everyday use, we run a script that automatically loads a new webpage every 40 seconds. The energy-saving profile is active, and the display brightness is set to about 150 cd/m². The Venue 11 Pro reached a battery run time of 4:40 h. Directly compared to its sister model (6:42 h), this not a good result. The two tablets are equipped with the same battery. We repeated the WLAN test several times with our current review device and ended up with the same result every time: The stronger Core i5 processor simply needs a little more energy in idle mode than its sister model's Core i3 processor. The Dell Venue 11 Pro offers sufficient performance for everyday tasks. Unfortunately, however, its Core i5 processor is unable to utilize its full performance capacity. As a result, the new device only offers a minimal increase in performance (at best) compared to the Core i3 version of the tablet. The rest of the hardware components don't differ much from those at work in the sister model. The bright, high-contrast IPS display with stable viewing angles is nice as ever. A quick solid state drive with a capacity of 256 GB joins the ranks here too. It would be easy to switch out the drive, as the back side of the tablet can be removed without any tools. There isn't much of a reason for owners of the Core i3 version of the Venue 11 Pro to replace their tablets with the Core i5 version -- the increase in performance is simply too small. In fact, the Core i5 model performed worse in some of our tests, and its battery life is shorter. The bright, high-contrast IPS display and how maintenance friendly the device is. The Core i5 processor can barely use its turbo. Lenovo ThinkPad 10, Microsoft Surface Pro 3, Wortmann Terra Mobile Pad 1160 Pro, Microsoft Surface Pro 2, HP EliteBook Revolve 810 G2, HP Pro X2 410 G1, HP ElitePad 1000 G2 (F1Q77EA).